On work surface, shape dough into a ball. Divide into 3 equal portions. Return one-third of dough to bowl; beat in orange peel, orange extract and drops of yellow and red food color until orange color is consistent. Remove dough from bowl; cover with plastic wrap. Clean bowl; add another one-third portion of dough. Beat in lemon peel, lemon extract and drops of yellow food color until yellow color is consistent. Remove dough from bowl; cover with plastic wrap. Leave remaining one-third of dough plain; cover with plastic wrap. Refrigerate all dough portions 1 hour. Shape each portion of tinted dough into a roll about 5 inches long and 2 1/2 inches in diameter; set aside. On lightly floured work surface, roll plain dough into a rectangle. Place roll of orange dough on plain dough. Roll plain dough in a single layer around orange dough. Cut away excess dough; reserve for yellow dough. Place orange sanding sugar on plate; roll dough log in sugar until completely coated. Wrap sugar-coated dough log in plastic wrap; refrigerate. Repeat process with lemon dough, remaining plain dough and yellow sanding sugar. Refrigerate dough logs at least 4 hours. Heat oven to 400°F. Line cookie sheets with cooking parchment paper. Cut chilled logs into 1/8- to 1/4-inch-thick rounds. With back edge of knife, score “segment” lines into each round, making only indentations (do not go all the way through). Cut rounds in half; place on cookie sheets. Bake 6 to 8 minutes or until set. Remove cookies from cookie sheets to cooling racks. Cool completely. Use a fine grater or handheld plane grater to remove the peel from the orange and lemons. Be sure to avoid the white pith, as it will impart an unpleasant, bitter taste. Sanding sugar can be found at some grocery stores and in the baking section of most craft stores. Other citrus peels such as lime and grapefruit can also be used in this recipe. 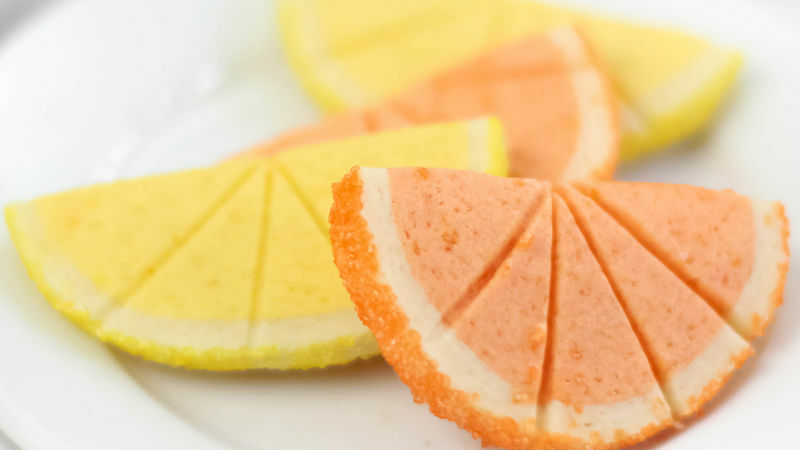 If using lime peel, use green liquid food color; if using grapefruit peel, use yellow food color or yellow and red food color to make pink dough.